All hunters should have a tree stand in their arsenal of hunting equipment, as it allows you to better blend into the background and offers a better vantage point to scope out the game trails. However, not all tree stands are the same. The multiple types offer different benefits and downsides. This article will provide you with information about some of the best climbing tree stands on the market along with what makes a great climbing tree stand. There are three main types that you can buy, all with a range of unique benefits and downsides. The following section will discuss these variations in more detail. These come in two parts, the seat and the actual platform to balance on. They take a little practice to set up properly as you’re more or less climbing the tree using these two sections. You can expect these stands to weigh around 30 pounds, which is a considerable amount more than a hang-on tree stand. However, they’re a lot better for stability and comfort. 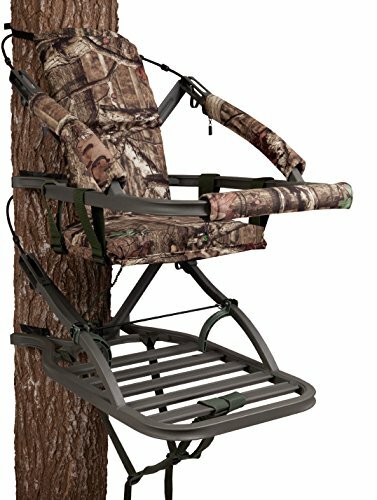 The hang-on tree stand is a lot more portable and the maximum weight of one of these units would be around 20 pounds. You should be able to carry this in your backpack far easier than anything else. These stands come as one single unit and can be set up using tree climbing steps. They’re a lot quieter than climbing tree stands, however, they’re not as comfortable. These stands are a lot less common and easy to set up. The ladder is the main difference from the other tree stands. This type usually reaches around 15 feet with a platform and seat built into the top of the ladder. You rest it up against the tree and then attach it halfway up with a strap as well as at the platform. They can be used more or less on any tree you want. However, they’re much heavier than any other type as well. It takes two people to set up the stand safely, which is why they’re usually just left in place once they’ve been installed. There are a few considerations to make before jumping in and buying your first or latest climbing tree stand. The following section will discuss the things you’ll need to think about to find the best climbing tree stand. The weight of your product is important as you’ll be the one hauling it through the woods to those game trails. You’ll want something that’s relatively lightweight. However, most climbing tree stands weigh, on average, 30 pounds. The material is also an important factor as this could add more weight to the product. 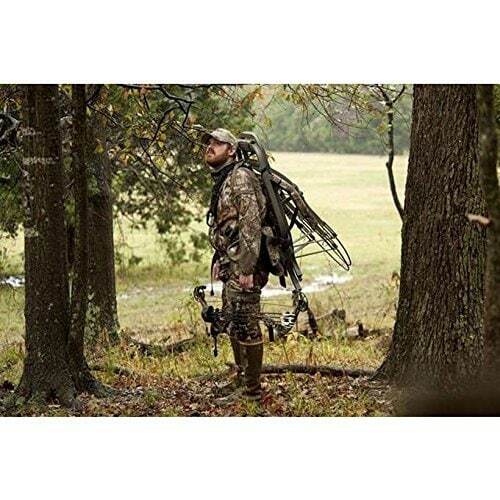 The safety features of the product are an important aspect of any tree stand. You want to ensure that you have a satisfactory number of tree straps and high-quality materials for support. Your tree stand should also be able to hold a satisfactory weight minimum of 300 pounds. For most hunters out there, comfort is the main priority when choosing your next climbing tree stand. You want something that supports your back, as much as your backside. Most of the best tree stands out there will have additional features like a bow rest and suitable platform size to move around on to find the best angle for that next shot. When climbing the tree and sitting inside, you’ll need to make sure that it fits your size. Hunters come in all sizes and so do climbing tree stands, so make sure you’ve got something that fits. The most important part of this article is the review section. This is where we’ll show you some of the best products currently on the market and go into detail about the various features as well as the pros and cons of each. This product is the overall best on the market for climbing tree stands. You’ll have the full benefit of multiple features like the foam padded seats with a comfortable backrest. Gone are the days of a sore back. The full body harness system will ensure your safety from the time you’re setting up your tree stand to when you’re aiming for that perfect shot. If you somehow fall, you’ll be happy to know that this harness system has your back at all times. 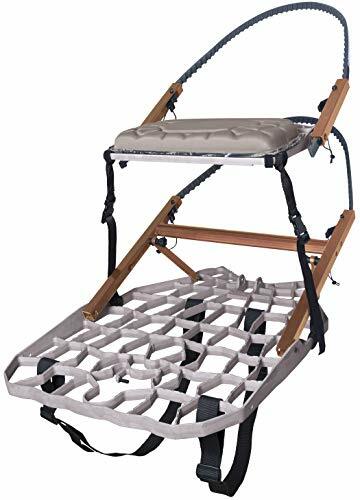 The aluminum frame will again ensure your stability and safety as it can withstand up to 350 lbs of weight. You’d need to be a big guy or gal to make this product fail on you. The full product will weigh around 25 lbs, which isn’t much considering what features are included with this tree stand. This product was voted best overall climbing tree stand for a reason. Holding up to 350 lbs of weight, you’ll be happy to know that there is a very small chance of this product failing structurally. Also, holding a huge amount of weight when it only weighs 25 lbs itself is another major benefit, as this is incredibly lightweight for climbing tree stands. The comfortable seating of this product is one of the best on offer right now with a padded seat and backrests, you’ll never have to crack your back ever again after a long shift on this tree stand. If you ever do find yourself on the verge of falling off, your safety harness will safely support you. The reason why this is a great benefit is that you’ll very rarely find a safety harness feature included with the tree stand. The only downside is the limited space for standing shots, as the platform is tiny in comparison to other models out there. The aluminum framing will ensure your tree stand is incredibly durable. This sound structure is what makes your tree stand withstand up to 300 pounds of weight, managing even the heaviest of hunters and equipment. The comfortable padded seats will always be a benefit, including that relaxing backrest that solves all of the typical back pain problems that come with hunting. If you ever do find yourself about to fall, your safety harness will do its job and save you from disaster. The full kit weighs roughly 20 pounds, which is great for a climbing tree stand. This product was a strong contender for the position of the best overall climbing tree stand. However, the only thing in the way was that it could hold 300 lbs which are 50 lbs less than the previous product could hold. The padded seat and backrest are really comfortable and are great for those long hunting shifts. This product is also 5 pounds lighter than the previous product which makes it amazingly one of the lightest climbing tree stands on the market. The only downside with this product was the same as the previous product in the fact that it had no platform space for adjusting your angle or view. 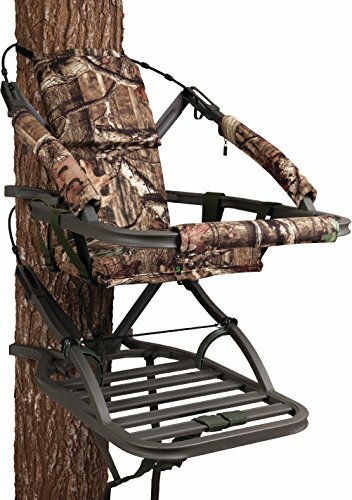 The comfortable padded seats and backrest will offer plenty of back relief, which has always been a common problem for hunters with average tree stands. Having been built with a steel frame and structure you’ll be happy to know that this adds stability and allows your stand to support anything with a weight of up to 300 pounds. The nylon foot straps make climbing the tree a lot easier and the whole process is streamlined, as before you’d need to do this with the side frames which was quite uncomfortable. The full setup weighs roughly 33 pounds. The product also comes with a safety harness. This product was voted the best value for money for a very good reason. There are plenty of benefits to this tree stand, like the fact it can withstand around 300 pounds of weight because of the extremely sturdy steel used for the structure of the tree stand. 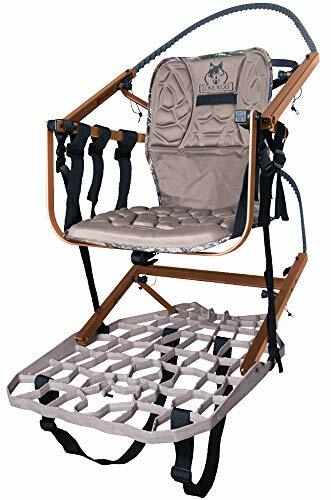 The strong and hard structure doesn’t sacrifice comfort as this product has both a padded seat and backrest that really help during those long hunting shifts. Even climbing up the tree is made easy for you with the adjustable nylon foot straps that make everything faster and easier. As expected, there are a few problems with this product, like the fact there’s very little room for adjusting yourself for a better shot due to the non-existent platform space. The 33-pound weight is also a huge problem as trailing this through the woods is going to be a huge burden. The safety harness is also quite cheap feeling and you probably wouldn’t feel safe putting your life in the strength of this harness. The aluminum structure is what gives this climbing tree stand the title of one of the lightest climbing tree stands on the market at only 11 pounds. Not only that, it can withstand the same weight as most other tree stands, up to 300 pounds. This product is also made of four parts that have been included in just one unit. The stand is secured using strong wires and has a padded seat that will keep you comfortable during the hunting trip. The platform also has a decent size which can let you move around for the best shot. This is the lightest product on this list at only 11 pounds. There isn’t anything on this list that can come close to the lightweight features of this product. The best part about this is that it can support the same weight as any other product, at around 300 pounds. Something that all tree stands should have is the padded seats, which this stand can offer. However, what it doesn’t offer is the backrest that should also be standard. The backrest is a crucial part of making the experience comfortable. The full tree stand is also secured using only a few wires, which doesn’t really scream safety but they do tend to work. The harness also doesn’t come with this product which should also be a standard safety feature. This is one of the comfiest tree stands you’ll ever find. The two-panel, contoured padded seat and backrest will ensure your comfort the entire time you’re in that seat. Along with being an incredibly comfortable seat, it’s also able to withstand some great pressure. Roughly 350 pounds of weight can be supported in this stand without breaking. When you’re actually trailing it through the forest, it comes with adjustable backpack straps and only weighs 20 pounds, which is great for any tree stand. It can also be packed away into a tiny four-inch package, making it a lot more portable. You also get a decent platform size as well compared to most other climbing tree stands. This product is amazing. It offers almost everything that a hunter is looking for in a tree stand. 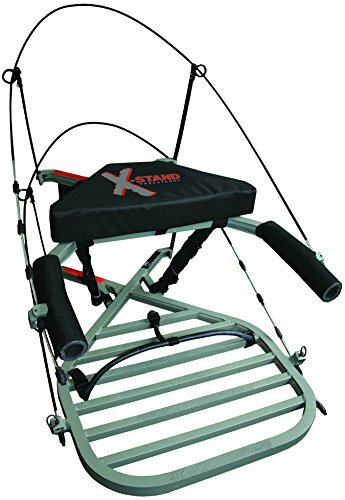 The sturdy aluminum frame offers a lightweight, yet strong, option as this product amazingly weighs only 20 pounds. This is way beyond what the average climbing tree stand usually weighs, so hauling this through the woods isn’t a problem. Even with it only weighing 20 pounds, it can still withstand roughly 350 lbs at any time, which is also the most any tree stand can support. The full pack can be stored away into a four-inch package making this easily portable. The padded backrest and seat are some of the greatest benefits that this product has to offer. However, the only complaint you might have is that the foam could be much thicker for even more comfort. This climbing tree stand is one of the best for those of a larger size. If you’re a big guy, you’ll have plenty of space on this platform to move around. Not only that, you’ll not need to worry about it holding your weight as it can withstand up to 350 pounds of weight, which means it’s one of the strongest on the market. You’ll not need to worry about space either, as this product can be folded into just a four-inch package that can easily travel with you anywhere you’re hunting. The full setup also only weighs 17 pounds. The padded seat offers some comfort during the long waits that most hunters have to endure. This product has plenty of space that will allow you to move around and find the perfect angle for the shot. 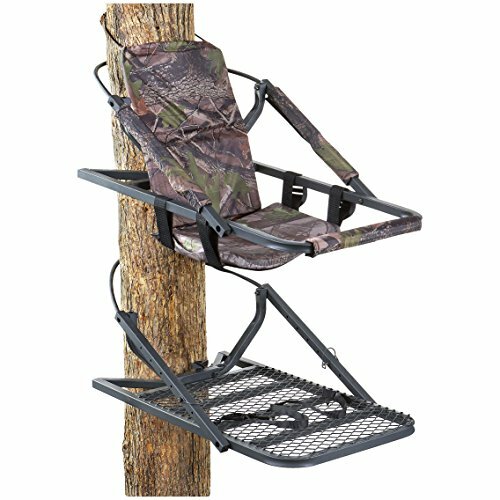 The portable and compact design is great for any hunter, as this tree stand can be folded down into a compact four-inch package. The structure is also fairly sturdy as it can support 350 pounds of weight, which is best suited for those larger hunters or heavy equipment. Thankfully it also weighs as little as 17 pounds, which is fantastic for any climbing tree stand. The only problem with this product is that it doesn’t have a backrest to support your back. There are a few steps you need to follow when setting up your climbing tree stand. We have put together a guide that will help you set the tree stand up in the fastest way possible. Here, we’ve included some helpful tips that work really well. Make sure you choose a decent tree that’s alive and stable. This needs to be done carefully as an unhealthy tree could collapse from your weight. Attach the seat to the tree first. When securing the bottom half, make sure it’s secured to compensate with the thickness of the tree, as many trees might get thicker or thinner as you climb the tree. If your system has straps that connect to each other, go ahead and connect them. This provides extra security. During the process of climbing the tree, you should be using a harness system which connects you to the tree. This should be used for safety purposes. Your harness should be secured above your tree stand. Secure your feet into the tree stand platform, which locks it in place to start climbing. Use your upper body to pull yourself and the platform up against the tree and then lift the seat up higher so you can repeat the process until you’re happy with the height. To get back down, you just carry out the same process but in reverse. If you need a demonstration or even a few helpful tips, please take a look at this Youtube demonstration. It’s easy to think you know what you’re looking for when choosing your next climbing stand but most people tend to be surprised with how hard it actually is sometimes. You need to take into consideration what we spoke about previously. We hope this article has helped you find what you need. This section includes some of the most common questions that people ask. We’ve tried to answer them to the best of our knowledge and we hope it helps. Is it Safe to Use a Tree Stand? 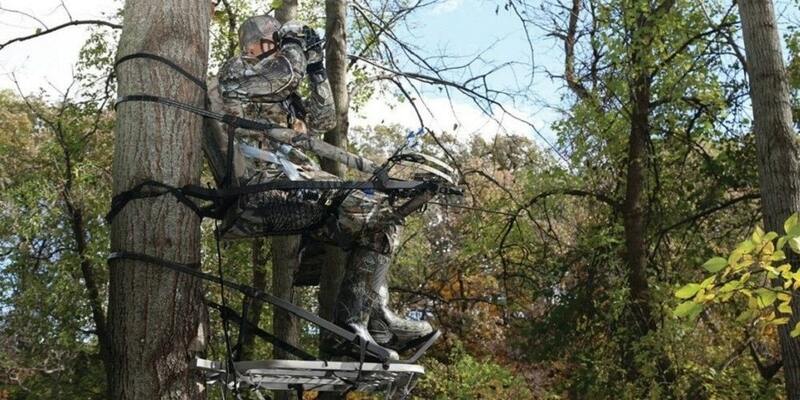 It’s safe to use a tree stand if you know how to use one properly. It takes some practice in order to successfully and safely secure your tree stand. If you’re stuck on the best way to secure your tree stand, you should follow our guide and watch the Youtube video we included. What Trees are Comfortable With the Stand? Almost all trees will be able to handle the climbing tree stand. You can adjust the belt attachments to fit even the thickest of trees. If you want a demonstration to get past small branches and bulges, you should follow our guide and watch the Youtube video we provided. How Durable are Tree Stands? Tree stands are extremely durable as they’re usually made from high-grade steel or aluminum. All tree stands that are worth your money should be able to withstand 300 pounds or more. Anything below 300 pounds shouldn’t be considered, as this is the standard now. Deer gather most of the information about their surrounding through scent. They find food, mating opportunities, and danger by using their nose. Most hunters know that hunting downwind from deer activity is the way to go. You should always hunt with the wind in your face. However, terrain can have a big impact on how wind moves through the area. Terrain should also be a major part of your strategy for entering and exiting the stand. If hunting a flat piece of land, the wind is pretty much going to be static. You will generally have a prevailing west wind. But whatever the wind happens to be that day, most of the time it’s going to stay that way. The biggest challenge for flat land hunters is getting in and out of the stand without being detected. Obviously, tree lines and creek beds are going to be the best way to sneak in. However, those are also the areas where deer will usually hide, especially in barren areas. The only way to avoid jumping deer while entering is with intensive scouting. Having a good idea of where potential bedding areas will help you plan a route with minimal disturbance.Most whitetail hunters hunt terrain with some hills and valleys or as we often call them, funnels. Funnels attract deer. It’s a shorter, easier path for them to travel through an area. Does will use them, so naturally bucks use them as well. We know that mature bucks will normally stay off the beaten trail, but they will travel through the same choke point. How to set up on these areas and stay downwind is the trick.Again, scouting is key. Knowing where bucks are feeding and where they are bedding will tell you what direction they are coming from depending on the time of day. This information will help determine which stand to hunt based on the wind. However, wind acts differently along ridgelines and draws. A hardy wind is bound to swirl in the valley. On windy days, the best stand sites are almost always going to be at the top of hills. Wind is most consistent at the top of the hill and the swirling effect is negated. Thermals are another element to be aware of. On cloudy days, thermal effects are less noticeable. However, on clear, sunny days thermals can be a big problem for bow hunters. Thermals occur when the sun heats the ground and trees on a hillside. The heat created travels up a hillside and takes any scent with it. Temperatures don’t have to be high to experience thermals. I’ve witnessed thermals in sub-freezing temperatures. Reverse thermals can also be a hindrance. As temperatures cool in the evening, air sinks and takes scent with it to the bottom of the valley.How do you work around thermals? Set up on the top of a ridge on calm and sunny mornings. Warm air will move out of the valley and up. On calm, clear evenings a valley stand is better. As air and scent move down the ridge, you will essentially be downwind of the thermal.There are few occasions in which wind direction is absolutely perfect. That’s why it’s important to have a multitude of stand locations available for any given hunt. With so many wind and terrain factors, a good scent control program is also vital to the success of any bow hunter. The deer hunting tree stand is a piece of hunting equipment no deer hunter should be without. Tree stands provide the deer hunter with a better view of the surrounding area and keep the hunter out of the deer's direct line of site as well as help scent to be dispersed before it reaches one of the deer's best defense tools, it's powerful nose. Tree Stand Safety- Tree Stand safety is probably the most important thing to consider when hunting for a new deer stand. Tree Stand Weight- Tree stands are manufactured in a variety of materials and styles all of which effect the weight of the stand. How far do I need to carry the stand? The weight of the tree stand can become a big factor when you have to carry the stand into a remote location or long distances. In the past weight typically corresponded directly to comfort and price. Today's modern stands have come along ways in regards to comfort, but you can expect to pay more for light weight aluminum stands compared to their steel treestand cousins. Speaking from personal experience I had a long time to reflect on my choice to save a few dollars in return for 20 extra pounds while trying to drag a deer and carry my stand out of some state forest after dark and I must admit I'm not sure I would make that choice again. If you have your own land or don't have far to carry the stand save the money and go with steel. If the area you hunt is remote and you need to move your stand or remove it from the woods every day go with the light weight aluminum stand. Tree Stand Hush Factor- All tree stands are not created equally when it comes to how quiet the stand can be transported, set up and climbed up. Is the tree stand you are considering quite? If at all possible play with the demo or display stand at the store before you purchase it. If the stand requires you to make a lot of metal clanging noises to set it up or clanks as you carry it into the woods find a different stand. I had the pleasure of hunting some public land in Northern Minnesota last season and was in my stand and set up well before first light. As the sun was about to rise down the logging road came a guy with a full ladder stand on his back. The stand was clanging against itself as he walked and he set up about a half mile from me, but I heard it bank and clang as he assembled it and put it up into the tree. Neither one of us say a deer until late afternoon. If you have a loud stand there are some things you can do to quite the stand down. I have found that pipe insulation wrapped around some of the key metal supports and taped down with black electrical tape will help to greatly quite a stand that clangs together as you walk. The same material can be used to help keep you bow or gun from clanging against the stand as you move in the stand.